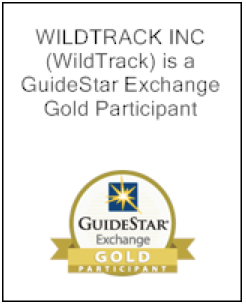 WildTrack awarded Guidestar Gold Status! The GuideStar Exchange (guidestar.org) revolutionizes philanthropy by providing information that advances transparency, enables users to make better decisions, and encourages charitable giving. WildTrack has just been awarded GuideStar Gold status, indicating the highest level of transparency. Please consider supporting our work by going to smile.amazon.com and nominating WildTrack as your charity of choice. It costs you nothing – simply each time you use Amazon (through smile.amazon.com) WildTrack will receive a small percentage of the revenue from them. Thank you for your support for our mission. Now it’s easy to help us!